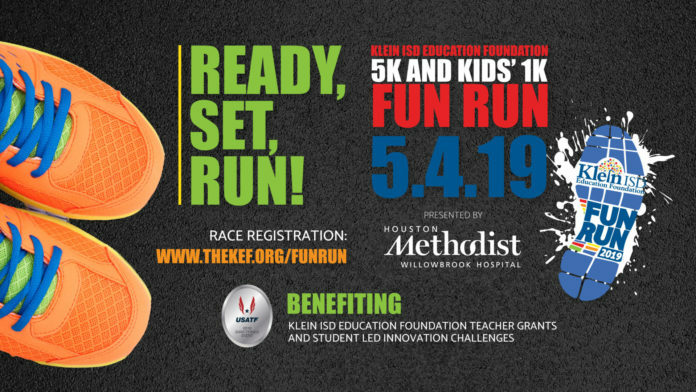 The Klein ISD Education Foundation is holding its inaugural Promise2Purpose Fun Run Saturday, May 4, 2019. The P2P Fun Run, presented by Houston Methodist Willowbrook Hospital, promises to be an outstanding opportunity for run enthusiasts, families, students, and community partners. There will also be bounce houses, student performances, costume characters, vendor booths, and much more! This event will have fun festivities for all. The 5K Run/Walk and Kids’ 1K will be held on Saturday, May 4, 2019, at Klein Memorial Stadium. Proceeds from the Klein ISD Education Foundation Fun Run will provide additional funds for grant awards to teachers for innovative classroom programs and for student-led innovation challenges in Klein ISD. Since its inception in 2000, our donors have made it possible for the education foundation to gift more than $2.8 million to the district! Below are some ways you can participate in this year’s Fun Run and make a difference for the students and staff of Klein ISD. Please click on the following link to register for a race: https://thekef.org/funrun. The Klein ISD Education Foundation is a 501(c)3 non-profit organization and donations are deductible to the fullest extent of the law. Continue reading for more details on the Klein ISD Education Foundation Fun Run. A Houston Methodist Willowbrook Hospital Athletic Trainer will lead a pre-race warm-up session. Use the hashtag #kleinfunrun to tag us in all of your Fun Run posts!